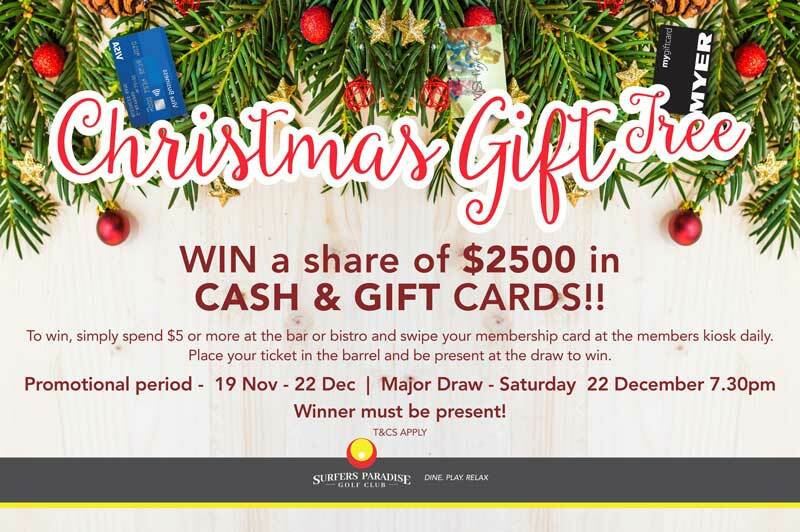 Win a share of $2500 in cash and gift cards!! Wouldn’t you love an extra $1000 in cash or a bunch of gift cards to give to your loved ones this Christmas? Then don’t miss our Christmas Gift Tree promotion! We have over 22 prizes up for grabs! You’ll receive an entry ticket when you spend $5 or more at our bistro or bar during the promotional period. Simply place the ticket in the barrel for your chance to WIN! Bonus tickets are also distributed via the Membership Kiosk, so remember to swipe your membership card daily. Don’t forget you do need to be present to win so book your table at the bistro today, and bring the whole family along for a fun-filled night, with live music from the fabulous Emmy Jae and free face painting for the kids. Entertainment from 6 pm and the draws commencing at 7.30pm.